Today, Nov. 29, the United States Mint released its last 2016-dated special occasion set. 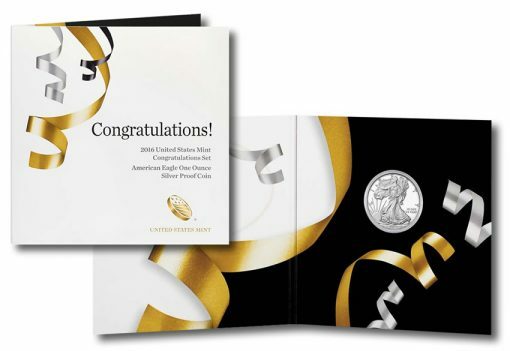 Promoted as a great gift for weddings, anniversaries, retirement, graduations, and birthdays, the 2016 Congratulations Set is available for $54.95. The 2016 Congratulations Set’s folder is congratulatory-themed with silver and gold ribbons. The Silver Eagle is encapsulated inside on the right with the left fold having an area to write a personalized message. A certificate of authenticity is printed on the back of the folder, while coin specifications appear on the back of a protective sleeve that wraps around the folder. Held within its celebratory-themed folder is a 30th anniversary 2016-W Proof American Silver Eagle. Annually issued, the one-ounce, .999 fine proof Silver Eagle is the U.S. Mint’s most popular collector coin. This year’s edition was released by itself in mid-September for $53.95. 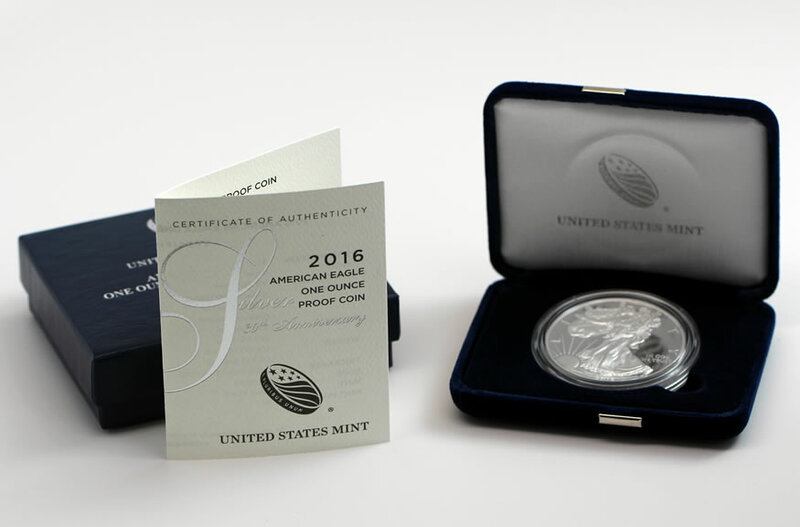 (See photos of a proof 2016 Silver Eagle.) Sporting a one-year-only edge with incused ’30th ANNIVERSARY’ lettering, more than 461,000 have sold so far. The 2014- and 2015-dated sets launched in January of their release year, with the first set debuting in April 2013. Sales could be lower for this year’s set because of the late release, which is mostly attributed to the manufacturing changes needed to make the Silver Eagle’s unique edge. Buy sets directly from the United States Mint right here, or call 1-800-USA-MINT (872-6468). They are no established limits. In January, the U.S. Mint also released 2016 gift sets for birthdays and newborns. Well how about that. With the year almost over they went ahead and released this set which some of us thought was not going to happen. I mean I already gave my Granddaughter her Graduation gift which I had told her it would have been this Set. But that did not happen. I instead made a Graduation Set of my own to give my Granddaughter. One 2016 ASE PCGS MS70 and then a 2016 1/4 oz. Gold Eagle also PCGS MS70. It cost me more but it will be a set from her Grandpa that she will surely be proud of. Thanks to the GOOD OLE’ US MINT! joera – Congratulations on being such a good and generous grandparent. I hope that you have planted the seed for another generation’s youth to take an interest in coin collecting.